President Donald Trump's job approval numbers continue to climb, according to the RealClearPolitics average of polls. After an NBC News/Wall Street Journal poll published Monday put Trump's approval rating at 46 percent among registered voters, his RCP average rose to 44.4 percent, his highest mark since October 2018 following the confirmation of Supreme Court Justice Brett Kavanaugh. Trump's highest RCP average of his presidency came was 46 percent after his inauguration. Two months later, it dropped below 44 percent and only briefly returned above that level in May, June and October of 2018. Despite that improvement, the numbers still indicate the president is vulnerable heading into the 2020 election. The NBC News/Wall Street Journal poll found that 41 percent of registered voters plan to vote for Trump while 48 percent said they plan to vote for whoever ends up becoming the Democratic candidate. And Trump's disapproval rating remained high at 52 percent, although that was an improvement from the 54 percent the poll found in January and December. When asked if it is more important that the 2020 Democratic nominee is able to defeat Trump than reflect their personal views on the issues, 40 percent of voters who plan to cast ballots in the Democratic primary said beating Trump is more important. Fifty-six percent said the candidate's policy positions are more important. 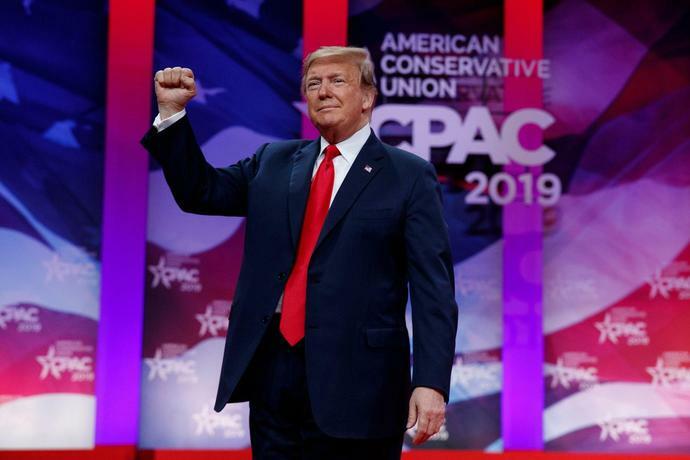 Altogether, 41 percent of registered voters said they plan to vote for Trump in 2020 while 48 percent said they preferred to vote for a generic Democratic candidate. By contrast, at about this point in former President Barack Obama's presidency, 45 percent of voters said they planned to vote for Obama while 40 percent preferred a generic Republican candidate. Trump's rising poll numbers come despite the record 35-day government shutdown, which most voters blamed on Trump, and opposition to his use of an emergency declaration to secure funding to build a wall on the U.S.-Mexico border. The poll was conducted from Feb. 24 to 27, so it does not necessarily reflect the impact if any, that former Trump attorney Michael Cohen's testimony to Congress might have on Trump's approval rating. Cohen called the president a "racist," a "liar" and a "cheat," and implicated the president in a number of illegal acts. Follow William Cummings on Twitter @wccummings.